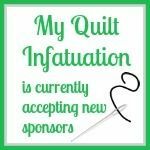 My Quilt Infatuation: September Deals and Giveaways! Happy fall, y'all! I know that some of you are in the same boat as I am, where it is a steamy 94 degrees, and a heat index that just takes your breath away. It just doesn't feel like autumn at all, even though we are only days away from the official first day of the season. I am definitely in a fall state of mind already though. We are already enjoying pumpkin goodies in our house, and I'm looking forward to a day where I can put on some jeans and boots and not pass out from heat exhaustion. I surely hope that some of you are experiencing some fall weather wherever you are! I am super excited for this month's sponsor post. 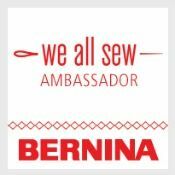 There are some amazing goodies being given away, along with some great coupons to help kick your holiday projects into gear. Let's start with the first of the giveaways, sponsored by Shabby Fabrics! 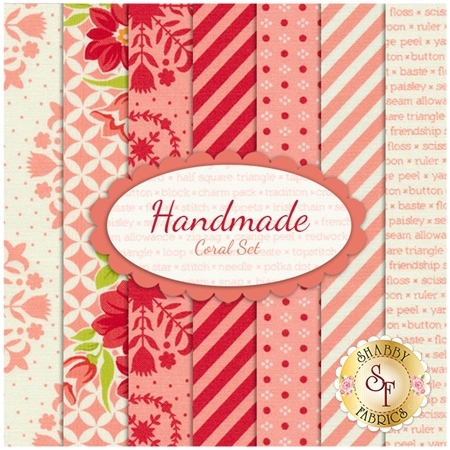 Shabby Fabrics is kindly offering a fat quarter bundle of coral color way from the Handmade fabric collection. Oh my goodness! 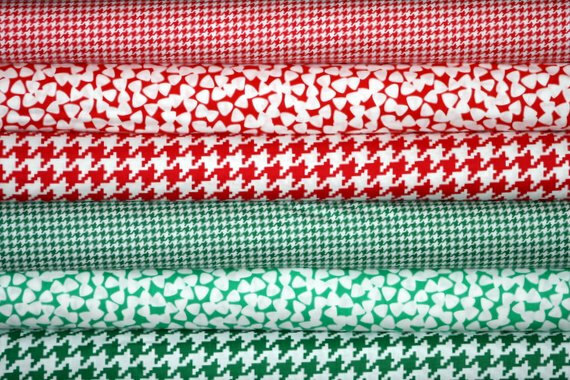 These fabrics are so scrumptious that I could just eat them up! Another cool thing that is happening at Shabby Fabrics right now, is their brand new monthly club. 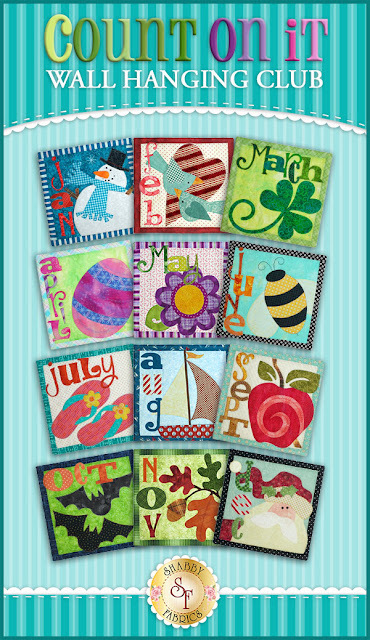 The Count On It Club is an adorable wall hanging club with designs for each month to add a little seasonal decor to your house. The best part about these kits is that all of the shapes are pre-cut and fused. All you have to do is peel off the backing, iron them into place, and stitch them down. Simple and cute! The club sign-ups are open now, and will start in January, so head on over there and check it out right HERE! 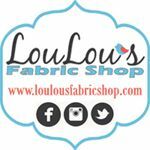 Over at LouLou's Fabric Shop, there are tons of great things going on as well! 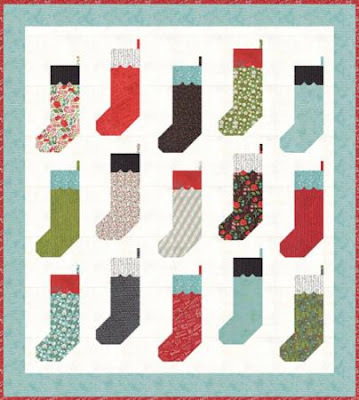 Tons of brand new kits, featuring great collections, like Sundrops, Bumble Berries, Cookie Exchange, Lullaby, and upcoming Bonnie and Camille Basics! Take a look at this adorable By the Chimney kit, featuring Juniper Berries! I would be remiss if I didn't also let you know that LouLou's Last Chance Clearance section is ahh-mazing! You can score gorgeous fabrics as low as $5.50/yd. LouLou's is also offering a great coupon for my readers. Use the code infatuation and save 20% off all orders over $50, through 9/21! My, oh my! 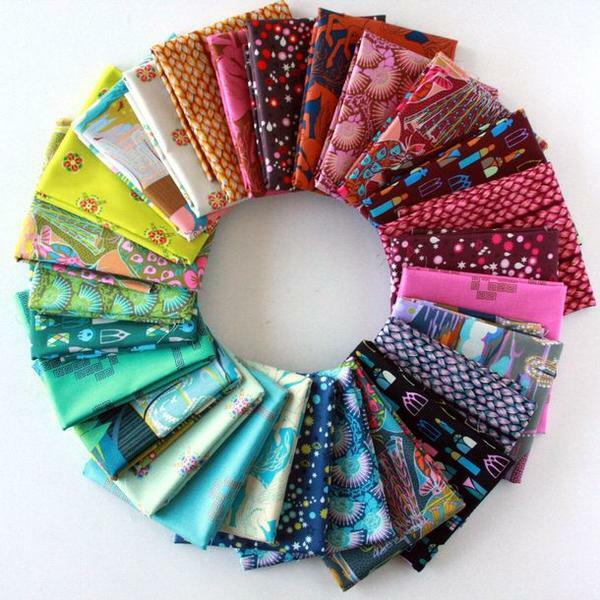 If you're looking for a fat quarter bundle for a special project, you simply must hop over to Lady Belle Fabrics. 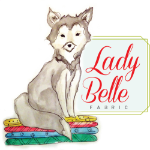 Lady Belle has just put tons of delectable bundles on sale at 30% off with no coupon needed. What a steal! There are too many to list, but let me tell you- this Fibs and Fables AMH bundle has my name all over it. Up next is Finer Ribbon. If you've followed my posts for awhile, you know that I am a huge fan of my custom ribbon labels. These labels are ultra soft, easy to sew right into the binding of my quilt, and they are fully washable and won't fade. I worked with the kind folks at Finer Ribbon, and they helped me design my label with my own logo, and I was even able to put washing instructions on the back. I wholeheartedly recommend their product to everyone! Right now, Finer Ribbon is offering a 15% off coupon with the code MQI15. 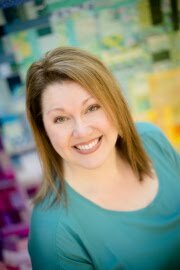 This doesn't happen very often, so if you're thinking about taking the plunge on labels to really add a professional touch to your quilts, I'd jump on it. 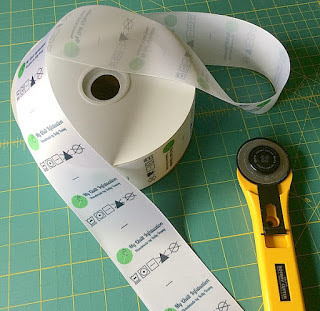 Each spool of labels has 1000 labels, printed with marked cutting lines, which works out to less than 10 cents per label! 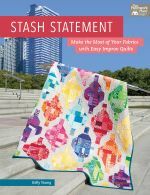 Five Monkey Fabrics is also offering a great coupon to help you stock your stash! Use the code MQI15 at checkout to save 15% off your entire purchase! 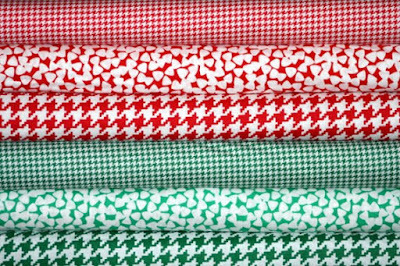 If you're like me, you're gearing up for some holiday sewing right about now, and just take a look at this awesome bundle of Christmas basics. Love them! 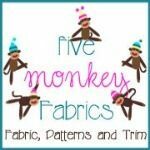 **Edited to add- Five Monkey Fabrics is actually on vacation until Monday, September 26th, BUT the coupon will be active for two weeks after they return! Last, but certainly not least is the Fat Quarter Shop. 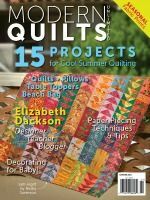 I don't know about you, but I've been seeing lots of super adorable quilts made with Jolly Bars, a FQS exclusive precut. They have a brand new book, with lots of fun Jolly Bar projects, and this month, they are giving away a copy of the book to FIVE lucky readers! That means that we will have SIX winners this month! Entering the giveaways is simple, just leave a single comment on this post to let me know your favorite fall activity (mine is heading to a corn maze with my family, by the way). Remember to leave an email address if you're a no-reply blogger, and only one entry per person please! Unfortunately, replies to your own comment counts as an entry (the system numbers those, too), so remember to put your email address in your comment. Additional replies/comments/entries are always deleted. I'll announce the winners at next week's NTT! This giveaway has ended. I will be announcing the winners at this afternoon's NTT. If you missed out, be sure to follow me on your favorite blog reader, or subscribe by email so you don't miss the next one. I host amazing giveaways often! I love going on fall hikes to see all the trees changing colors! My favorite fall activity is driving around and seeing the beautiful fall leaves. I especially love the red ones! What a wonderful giveaway! Thanks for the chance. Great sponsors! Road trips to see all the fall colors. Picking apples at nearby orchards! My favorite activity in the fall is QUILTING! Working on my first Halloween-themed one to be showcased on an Eerie Nights Blog Hop next month. Thank you for hosting such a wonderful giveaway. When we lived up north, my favorite fall activity was to go to a pumpkin patch. Now that we live in Orlando, that's just not something that they really have. So our new favorite is heading to Epcot for their amazing Food & Wine festival. Also, I just got my labels from Finer Ribbon yesterday. I'll be posting about that soon. They were awesome, just like you said. :) So happy with them. My favorite activity s going to the Fall festivals. Thank you for the chance. Oh gosh! All the amazing deals and giveaways! My favorite fall activity is simply being able to sit outside in the evening without melting. (Central Alabama here. 94 degrees today). My favorite fall activity is baking apple pies from freshly picked apples. My favourite fall activity is picking apples and baking apple pies. Thank you for the great giveaways. My favorite Fall activity is going to the pumpkin farm to pick out pumpkins for the house! We used to go out in the field to get them, but now we just visit the store there to pick them out. My favorite fall activity is baking pumpkin cookies. Thanks for a chance to win! My favorite autumn activity is sewing quilts with my favorite autumn colors while pumpkin bread is baking. My email should link but if it doesn't, frommycarolinahome at gmail dot com. Thank you so much for the opportunity to win! Favorite fall activity is watching the leaves change colors. Pumpkins, pumpkin bread, pumpkin lattes,and fall decorating. My daughter was born on Halloween so I always started early with fall decorations to celebrate her birthday the whole season! Since I live in an area with very warm(hot) summer weather, I love the opportunity to refresh my garden and just enjoy being outside. Fall means fire pit fires and roasting marshmallows under the stars. I got married in the fall, so my favorite activity is to go for a drive through fall foliage with my darling husband. My favorite fall actvities are enjoying cooler weather, wearing fall clothes, going on hikes, and watching the new seasons if my favorite tv shows! My favorite activity is smelling pumpkin bread in the oven on cool mornings. Favorite fall activity is going for family walks in the woods behind my parents' house. 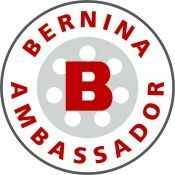 Fun giveaways! Thank you. My favorite fall activity is taking a walk and enjoying the cool weather and colorful leaves. My favorite fall activity is taking the grandkids to the pumpkin patch. I love to get outside and rake leaves. The cooler weather makes me happy! Thanks! I love fall, it is hard to pick so i am going to say i like to enjoy the weather and be outside in that crisp cool air. I love fall. The fall leaves, the cool crisp autumn air, pumpkin flavored everything! Too much to list! Thanks for the introductions to these sponsors and for the chance to win! I love to take a hike and enjoy the vibrant fall colors in the nature. I like to bake pie or cakes. We love going up to a farm about an hour away to buy Fall treats and pumpkins. My favorite fall activity (if you wanna call it that;-) is eating pumpkin soup and drinking pumokin spice latte. I love going hiking and taking photos of the gorgeous fall colours!!! My favorite fall activity is watching Steeler football with my friends. My favorite activity is walking outside now that the heat is gone!! Thanks for the chance!! Decorating for Halloween is the BEST fun in the fall. I've been eyeing that little book and may just have to buy it if I can't win it. Walking in the woods and watching rugby! I love going to the pumpkin patch with my family on a cool fall day.... a slice of Heaven! Favorite Fall Acitivity is eating apple cider doughnuts......I mean going to apple orchard with my family. Living in Central Virginia my favorite fall activity is driving through the mountains and looking at the beautiful colors! Watching football! We're going to a college game tomorrow and that's always a blast! My favorite part of this season coming up is post season baseball. I love watching the best of the best play snuggled under a blanket. Thanks for hosting all of these giveaways. My favorite fall activity is the first night that it's cold enough for a fire in the fireplace. Since we live near Houston, that's more like a winter thing--but it's what I look to most about the weather changing. That and wearing jeans and boots finally!! My favorite activity is taking a fall hike with my family. The smells, the crunch of the leaves and the cooler weather are all awesome. My favorite thing is to get out my knitting! After a long hot summer, it is lovely to sit of an evening with my knitting, in front of the TV. I love exploring the woods in Northeast Ohio during the fall -- so much color to enjoy!! I love carving pumpkins with my kids. Apple picking! Love it - and eating a freshly picked apple - you can't beat that! My best girls and I head to the mountains (NC) for a long weekend of quilty fun! Can't wait!!!! I love the smells of Fall and hunting for brightly colored maple leaves that have fallen as I walk about. I look forward to seeing all the little kids trick or treating. The Quilts From the Heart retreat in September followed by the Evergreen Piecemakers retreat in October are my favorite Fall activities. what wonderful give a ways. thanks for the chance. one of our favorite fall activities is going to the pumpkin farm. not only do they have pumpkins, but all other kinds of farm grown veggies, preserves etc. They have food to buy there (we usually bring a picnic basket) hand made items, rides for the kids and of course animals. it is an all day wonderful affair. we usually go with other families. My favorite fall activity is taking my grandsons to the pumpkin patch for some fun and a hay ride! Walking in the forest in cool, crisp, fall air is my favorite activity. Autumn is my favorite season by far. Thank you for the sweet giveaways. I visit all these sponsors. Amazing websites! Hope it cools off for you soon! Great Giveaway. Autumn means trying to prune everything in the garden and get it ready for winter. Also walks in the countryside, admiring the leaf colour and the loads of berries around this year. Favorite Fall activities are Picking apples & making apple sauce & apple butter! Also getting our wood burner going...and being outside seeing the trees change & getting garden & yard set for winter. Favorite fall activity? I love to savour the feel of the cooler air, wander and crunch the leaves as they fall and of course all of the fresh fruits and vegetables that are ripe and ready! Fall is the most beautiful time of the year. I just love the color of the turning leaves. Spending Thanksgiving with Paul's family is definitely the best part of the season. In the fall when things start getting cool, I love to cuddle up under a quilt (or two!) and read books. I love baking yummy fall desserts..warm bread pudding, all kinds of apple goodies, pumpkin pie...mmmm. my favorite fall thing is pumpkin pies, apple cider, haunted houses. We love going to all the festivals in the fall, when the weather is a little cooler. And pumpkin pie just tastes better in cool weather! Here in AZ, fall means cooler weather and we can all get back outside and enjoy morning walks, festivals and al fresco dinners. It's pumpkin season (at least in my mind) and I love to eat just about pumpkin everything. I will be making pumpkin cookies soon. Also Merb's Bionic apples are in season here. This delectable treat is a large apple covered in delicious caramel covered in nuts. It is absolutely delicious. I love me some apple picking in the fall. I also love the anticipation of Christmas! Thanks Kelly, thanks sponsors! Off to check out those clearance bundles now! I absolutely love decorating for fall! Great prizes you are offering, thanks for the chance! Where I live we often don't get Fall weather until late October or into November, but I'm looking forward to opening the windows, sitting outside, and swapping out the only summer clothes for some jeans and a few long-sleeved shirts! Simple pleasures :). My favorite fall activity in doing bicycle along the canal with my lover!! I love getting in the car and driving the scenic roads of the upper peninsula of Michigan to enjoy the beautiful colors of the trees. It's a hidden gem! Love watching the leaves turn - oh, and those pumpkin spice muffins! Over the years I've really come to enjoy a good college football game on a fall afternoon. I've always loved camping in the fall. So many pretty colors and the fire is so cozy! Thanks for all the awesome giveaways! Great giveaways! Fall in northern Ohio can be glorious! I enjoy many activities, not the least taking walks with hubby and beagle in our beautiful gem, the Cuyahoga National Park, which lies within the Ohio & Erie Canalway, and includes or is adjacent to several of the reservations of the Cleveland Metroparks "Emerald Necklace" and portions of the Summit County Metroparks system. So much to enjoy, and so many lovely inspirations for winter quilting! Thanks as always. (janeherbst at roadrunner dot com). Picking pumpkins and cleaning out the seeds, slime and all, and roasting the seeds, salted lightly. Thank you so much to all the sponsors...great start to holiday projects and seasons beyond. Picking apples and going for a hay ride. my grandchildren turned 5 this past July (triplets) and I have spent thanksgiving with them every year since their birth - will be leaving on the 16th of November this year, they have always lived 2500 miles away - this past few years have done some fun christmas cookie baking as well! My favorite fall activity is "embellishing" my front porch for the season! One of my favourite fall activities is going for a long drive to see the fall color. I live in Central Ontario and it is famous for the changing of the leaves. If you catch a sunny Autumn day the colours are unparalleled to anything else I have seen in nature. Bold reds, yellows, burnt orange, deep purples and lush browns. It's absolutely beautiful!!! michelletetlock@live.com. My favorite fall activity is baking and looking for fall fabric. I love the autumn colors. Our local Apple Orchard opens the weekend of my Birthday (Aug 31st) so my favorite fall activity is taking time every few weeks to visit the orchard to purchase apples, eat Apple cider doughnuts and end each visit feeding the goats. Later in the fall we drink hot apple cider. Thanks for the giveaway! 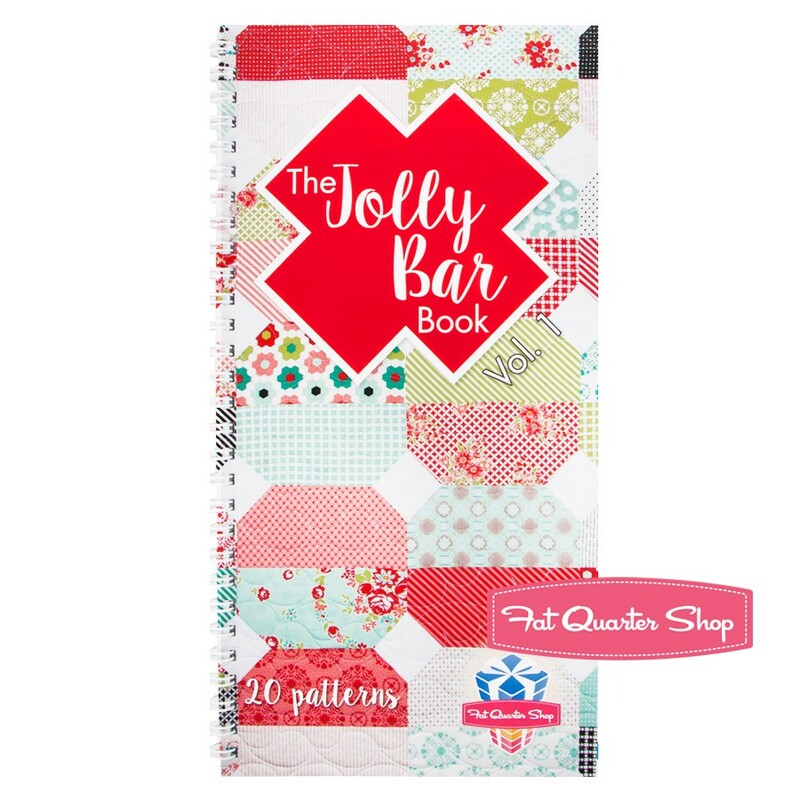 Oh I would just love to win the Jolly Bar book. It is so cute! If a book can be called cute . . . anyway, favorite fall activity? I actually enjoy raking leaves! I do not consider it a chore. I find it enjoyable! My favorite fall activity is eating pumpkin bread. I'm not sure I have one, I really don't get on with cold weather. Although I suppose it does provide a good excuse to stay inside and quilt! My favorite fall activity is to take advantage of the cooler weather and sew. When it's too hot I just don't want to be sitting in front of my sewing machine. Thanks for the giveaways. It would be great to win any of them! Going up to Apple Hill for all of the wonderful apple pies and other delicious treats. I love driving up to the north Georgia mountains to enjoy the beautiful fall colors. 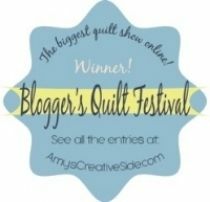 So much wonderful inspiration for fall quilts! I would love to win a copy of the Jolly Bar book--thanks for the great giveaway! My favorite fall activity is watching football! We also have a lot of fall birthdays so there's lots of celebrating going on! Thanks for the giveaway! My favourite fall activity is getting back to baking and cooking hearty meals! I love going on hay rides. My favorite fall activity is fitting in all of our final outdoor activities before the rains arrive. Even yard work feels like fun, knowing that it will be months before we can work in the sunshine or dry weather. When we feel the weather make its annual dramatic change, we rush outside and start playing frantic catch up on all of the projects we've been intending to do all lazy summer-long. Favourite autumn activity...watching the trees turn red/gold/brown - so great to see the change in seasons. I love watching football and finally after the long summer, the football starts. I go to the games with my husband, my sons, my brother-in-law and my nephew and niece. It is a great family activity. Two words- leaf piles! Love crunching through leaves on walks too. I love walkin at the park in the cooler temps! When you see my favorite fall activity, you might say, "One of these things is not like the others." I like to make a list of all the new TV shows that might interest me, and make a point of seeing all the pilots. I really look forward to the Fall TV season each year. Sometimes I'm working on a quilt while I'm watching! Thanks for the opportunity to win goodies! My favourite fall activity is cleaning up my flower beds and getting all the plants ready to be tucked in for the winter. Thanks! I love hiking in the woods in the fall. I love to go to the beach and enjoy the ocean view. My friends and I will begin to go hiking on weekend to take photos next month till may,and Fall is a fabulous season to take flowers pics.,Love how the color change from green,brown,yellow,gold....and crunching the leves. Favorite Fall activity, besides quilting of course, would be gardening once the weather is cool but not raining yet, and square dancing (but that's year round favorite) otherwise. Walking the dog through all the fallen leaves and coming home to a mug of hot chocolate. Thanks for the super giveaway. My favorite autumn activity is taking my granddaughter to the pumpkin patch, which includes a hay bale maze! Going to the pumpkin patch to pick out pumpkins and then taking a hayride with my children. Fall will hopefully bring cooler temperatures. Our heat index was 105 today. I enjoy hiking through the woods and scuffing the dry leaves when the temperature is cooler. I just love the cooler weather, wearing sweaters, and jeans with boots! I, too, love to kick around the fallen leaves on crisp, cool fall days.